While the premium price tag on Ragababes may be hard-to-swallow, we love the fit and reliability of the Ragababe 2-Step. This all-in-two diaper has many premium features that make it worth the investment! Read our full review and enter to win not one, but two awesome Ragababe 2-Steps! In celebration of her son's third birthday The Anti June Cleaver partnered up with a group of bloggers and fellow cloth diaper addicts to bring YOU a gift. Her favorite diaper, the highly sought after RagaBabe 2-Step. If you've tried RagaBabe then you know how amazing they are. If you haven't but have wanted to, here's your chance to score one without having to wait for a stocking. Read our full RagaBabe 2-Step review below, and then scroll down for the rules of this contest and the official entry form! Ragababes are hard to snag, and they hold their value well (used ones often sell on buy/sell/trade boards for close to the value you would pay new!) 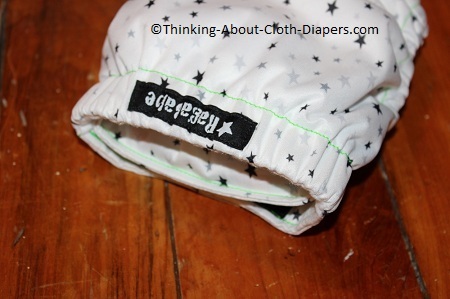 This diaper is considered an All-in-Two, as the Organic Sherpa inserts snap into the shell. Each 2-Step comes with both an insert and a doubler. Read our Ragababe 2-Step review below to find out why Ragababes are all the rage. And then scroll down... because we've joined together with a few other cloth diaper blogs to offer you two great chances to win a Ragababe of your very own! One of the features of the Ragababe is a wide back elastic. Most diapers have a narrow elastic, but Ragababe's wide elastic makes a big difference, providing a comfortable fit, and reliable containment, even with big messes! Ragababe comes with one organic cotton sherpa insert and one organic cotton sherpa soaker. I love that the insert snaps at the back of the insert, and it has a short "pocket" at the front that holds the front of the insert in place when you're putting it on your baby. No shifting of the insert... perfect for squirmy little ones! The insert is made up of 2 layers of organic sherpa cotton outer, and 2 inner layers of bamboo rayon, that are serged and snap into the diaper. The soaker (booster) provides 2 more layers of organic cotton and one layer of bamboo rayon. When all are used, this diaper is incredibly absorbent, and even worked for us for night time use. 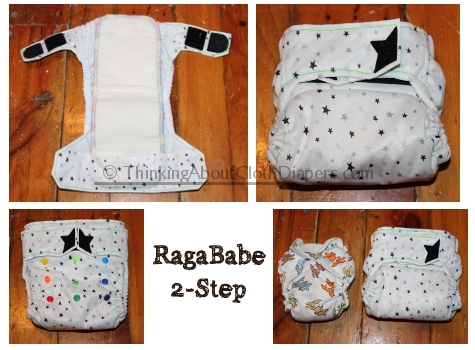 Ragababe 2-Step inserts are sized: Small for newborn 2-steps, Medium for Size 1 2-steps, and Large for Size 2 2-steps. As with any all-in-two, Ragababe 2-Steps are designed so that you can replace the soiled inserts and re-use the covers. The sell is lined with quick-drying non-wicking suedecloth fabric, which is an excellent option for all-in-twos because it can be wiped or rinsed between "wet" uses, allowing for more than one change out of each shell. You can simply change the insert, and then switch back and forth between two shells to allow them to air/dry between wearing. From the Ragababe website: "We recommend rotating back and forth between covers throughout the day, wiping down the lining inside your cover with a wet cloth between wet diaper changes. You will need to machine or hand-wash your cover when baby poops." With an all-in-two system, you will generally need 6 to 8 covers, and can purchase 2 to 4 inserts per cover. This helps off-set the higher costs. Ragababe was one of the first diapers (with the exception of covers) where I used hook and loop and actually liked it. They don't even offer a snap-closure option! They use a premium Velcro-style closure, which doesn't curl up, and also remains sticky for a long time. While you sometimes see the "points" on their trademark stars get a little "fuzzy" from lint, their hook and loop stays looking new long past many of the hook and loop styles currently on the market. I purchased the size 1, which is recommended for babies 9 to 30 lbs, it is not designed to fit right from birth, but they do offer a size 0, which is designed for newborns (4 to 18 lbs). 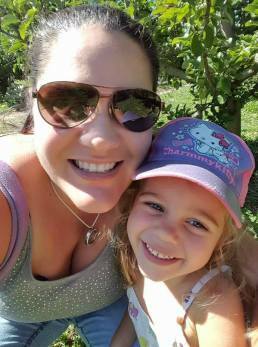 For slimmer build children, the size 1 may fit right until potty-training, but Ragababe recommends the size 2 for chunkier children (15 to 40+ lbs). Depending on your baby's build, you would likely only need newborn and either size 1 or size 2. The cross-over "overlap strip" hook and loop tape (above my finger) comes standard on snap rise 2-steps, and provides additional waist adjustability, which can help size down a bit. 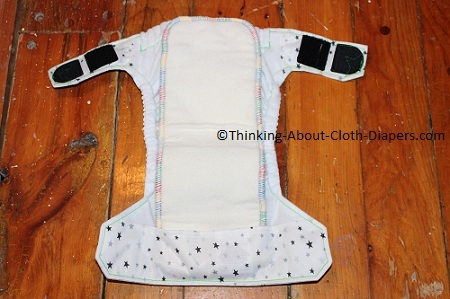 The wide velcro landing strip (front waist band) also allows the diaper to size out quite large. 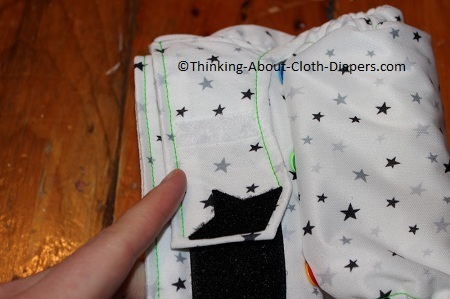 I also felt that the rise was similar to other diapers, and it does fit quite true to size. This diaper is one of the most expensive ones I own, and for many, $36 per diaper is not a budget-friendly option. I do love this diaper, and to me the attention to detail, custom options (colored snaps, etc) and premium features, including organic sherpa, do set this apart from diapers made in factory settings. I love that this diaper holds its value incredibly well, and for that reason alone and I can totally understand why many become lifelong buyers of Ragababe. Another bonus for Ragababe: they use a premium elastic in the legs and waist band, which they call "Last-Ever" elastic, and they advertise that it will never need replacing. Most diapers don't use premium elastic, and often don't last through more than one baby without some repairs and elastic replacement. There's not much I would change about this diaper. 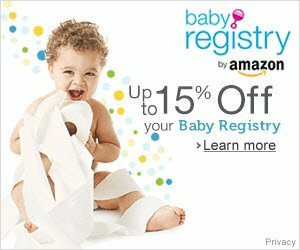 I really do wish it was available from other retailers, though, because I would love to combine shipping with other diapers and accessories I order. And now, for your chance to win one! Are you ready to find out how to get your hands on a Ragababe? 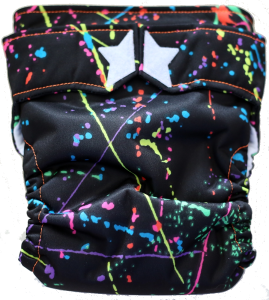 Well, you're in luck because one of our readers will win an organic RagaBabe 2-Step in a size 2 (fits from 23-34 lbs) in the coveted 5th Anniversary Limited Edition Paint Splatter print! This giveaway is a little different than others you may be used to. Instead of following a bunch of social media accounts you will get the chance to discover some great content and hopefully discover new blogs to follow. We hope that you have fun in the process. You will go on a scavenger hunt to find the badge on each blogger's site. It will be hidden in one of three posts on each blog. Find the badge and put the RagaBabe print or color that you found in the giveaway form. There will also be additional optional entries for commenting on and/or pinning posts that you've found and enjoyed. We hope you enjoy getting to know The Anti June Cleaver, Cloth Diaper Guru, Wife Mummy Nurse, Cloth Diaper Geek, Thinking About Cloth Diapers, Viva Veltoro, Sunshine Praises, Leettle Baby, A Mama Collective, Cloth Diaper Addicts, and My Cloth Diaper Stash. Please enter the giveaway using the Giveaway Tools widget below. There are a lot of opportunities to get daily entries though none of them are mandatory to win. Disclaimer: Thinking About Cloth Diapers and RagaBabe are not responsible for prize shipment. I was not compensated in any way for promotion of this giveaway. Facebook, Twitter, Pinterest and any other social media sites are not affiliated with this giveaway. Winners will be notified by email and are expected to claim prize within 48 hours, otherwise another winner will be selected. Ragababe can only be purchased on their own website, Ragababe.com. Shipping is $3.95 for US, and more for orders to Canada. No readers have reviewed this product. 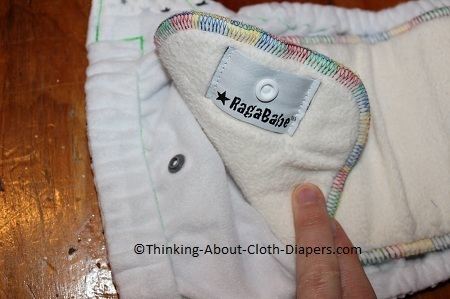 If you've tried a Ragababe 2-Step diaper, please share your opinions of this diaper with other readers. 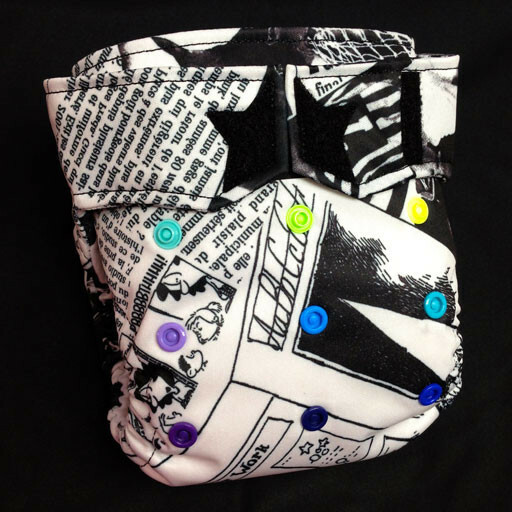 Simply fill out our quick form at the bottom of our Cloth Diaper Reviews page. It only takes a couple of minutes!